The Brick Wall is notable in the Mega Duck canon in that it is one of the only games not to bear the Sachen trademark. instead it lays claim to have been developed by Timlex, in-house, as the handheld's official pack-in title. Of course Sachen have disguised themselves before on the system (under the pseudonym of 'Commin') and so may have had a hand in it. However, as The Brick Wall doesn't appear to have been ported to the Game Boy once Sachen jumped ship, it can indeed be seen as something of an oddity: a first party system exclusive. Such a pity then, that it is so very average. Let's start with the positives. Although it could be seen to borrow aspects of its gameplay somewhat from Atari 2600 title Oink!, it is different enough to be called an original effort. You play as a small square tank (although this is obvious only from the artwork on the game's box) tasked with defending the titular brick wall from a much larger enemy tank. As the enemy tank lobs bombs at the wall, gradually eroding the bricks, your task is to lob bricks back, plugging the hole. If the enemy finds a clear path through then it's 'Game Over'. Fortunately, you only need to survive for a pre-set period of time to win the round and clear the level. The Level Selection screen. Every detail has been spared. If you are a masochist then you can play the game for yourself at this link. The darker bricks are stacked and therefore impenetrable by future shots. Aiming is a convoluted process. your tank exists on a grid of squares stretching 10x7, the same size as the brick wall you are defending. So to plug a gap in the brick wall you must position your tank on a similar part of your own grid. if your brick lands on top of another it will create a twin layer that you cannot fire past in future. This can lead to frustrating moments as you misfire and end up blocking your own progress. Fortunately, with a press of the 'B' button you can transform your square tank from brick hurling mode to a circular bomb lobber, allowing you to destroy any excess bricks you may have hurled accidently. 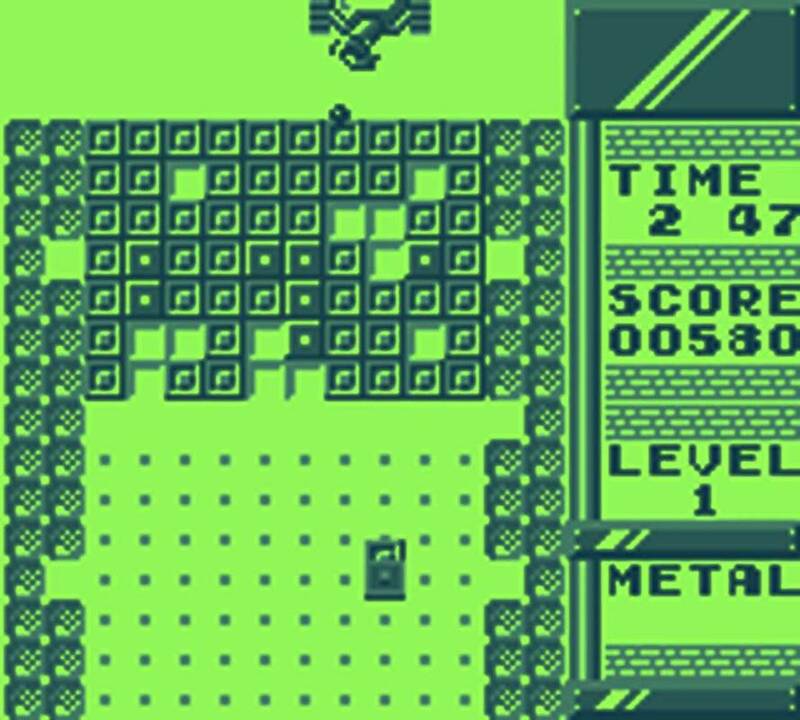 The game also throws in another feature as, after having fired a certain number of bricks, the 'Metal' indicator in the bottom right of the screen will fill up and you will temporarily fire impenetrable metal bricks that, while not blocking your own shots, cannot be destroyed by the enemy tank (although these revert back to regular bricks after a time). 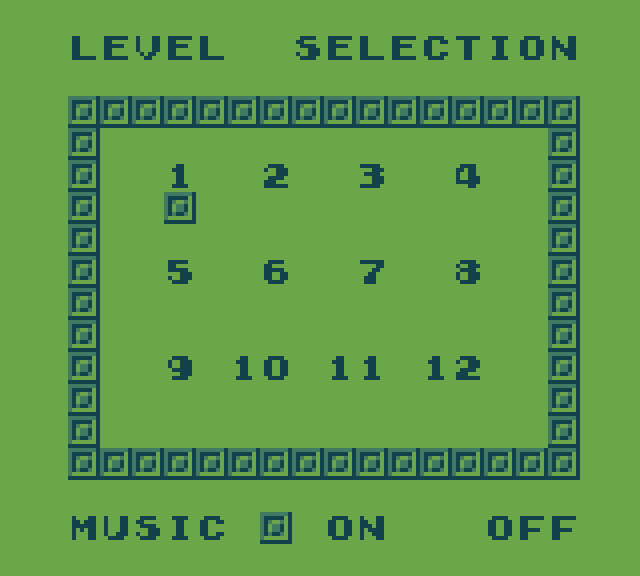 There are twelve levels available for selection from the title screen with each more frantic than the last. You can also opt to turn off the irritating music, unfortunately this also turns off every sound in the game, so it is really no different to just muting the Mega Duck with the volume slider. Levels themselves are merely increasingly difficult, repetitive variants of one another and the game never does anything surprising or interesting enough to justify its existence as a pack-in game. If Timlex were hoping that The Brick Wall would be their Tetris then they would have been better served noting what aspects made that game an addictive classic. While The Brick Wall isn't a terrible game it isn't anything memorable either and doesn't stand out amongst the plethora of other puzzle games on the system, many of which are equally mediocre. An underwhelming start to the Mega Duck's library.